"There is a long history about the ups and downs and ebbs and flows in the fight to maintain Fort Negley, but the important thing is, that for decades a lot of hard-working people, who care about the history of this city and the importance of preserving the sacrifice that got us where we are today, have stepped up and made possible the refurbishing of this Fort. There is now a beautiful visitors center, and easy access to view the structure with boardwalks throughout. It is now a safe place to come and learn about, not only the key role this city played in the conclusion of the Civil War, but also one of the most important stories of the sacrifice and courage of African Americans in their effort to achieve and find their deserved place within their newly “promised” freedom. " "Metro government is setting a dangerous precedent. If we allow this to happen, then what is to stop our government from long term leasing or selling our park." "We should not commit another sin, another heartbreak for the citizens of Nashville by a continued disturbance of hallowed ground." "What a great opportunity to better share the story of the Fort, its role in the defense of Nashville, and the more than 2,700 African Americans who labored to build the fort and the many who died doing so." "I hope that the Metro government will ultimately decide to do the right thing so that we do not have to once again regret the loss of yet another Nashville historic landscape." "Would it not be a better long-term plan for Nashville, to choose places for housing that are not historical sites?" 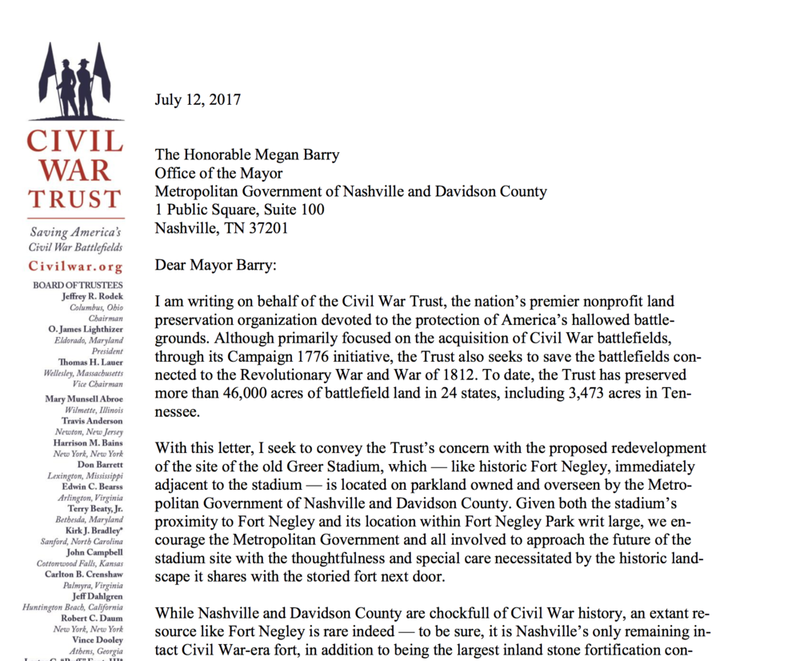 Accordingly, we urge the Metropolitan Government to renew its outreach to the Friends of Fort Negley and other stakeholders with a demonstrated interest in safeguarding Nashville’s surviving, tangible Civil War heritage for current and future generations." 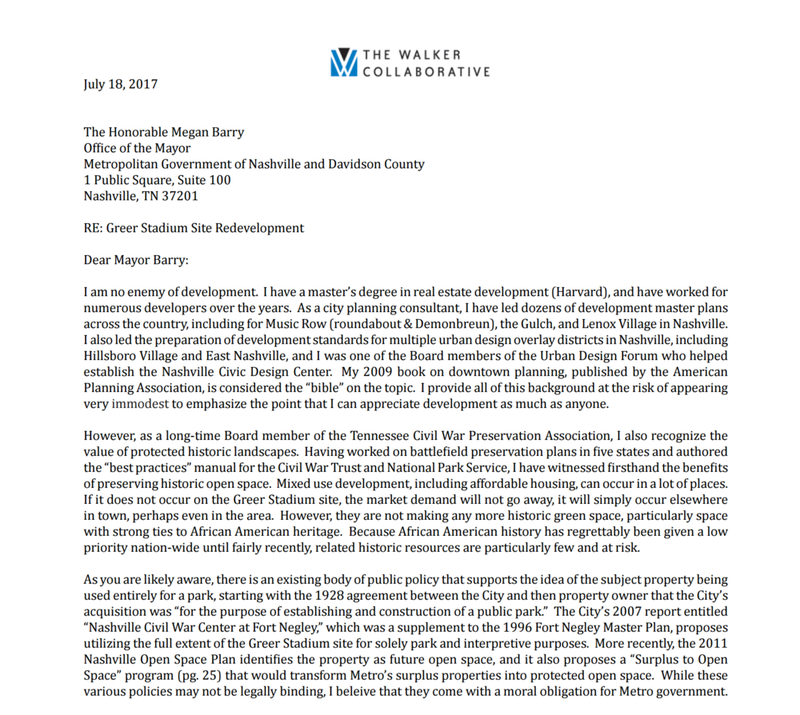 "The development of the Greer parcel would set a dangerous precedent for developing Nashville’s parks, threaten the preservation of a nationally recognized Civil War heritage site, dishonor unmarked African American graves, and deprive Nashville of the opportunity to hold on to much-needed green space in the heart of the city." "If this land is developed, any chance of further historical or archaeological research into their lives and struggles will be lost forever. Please do not allow this to happen." 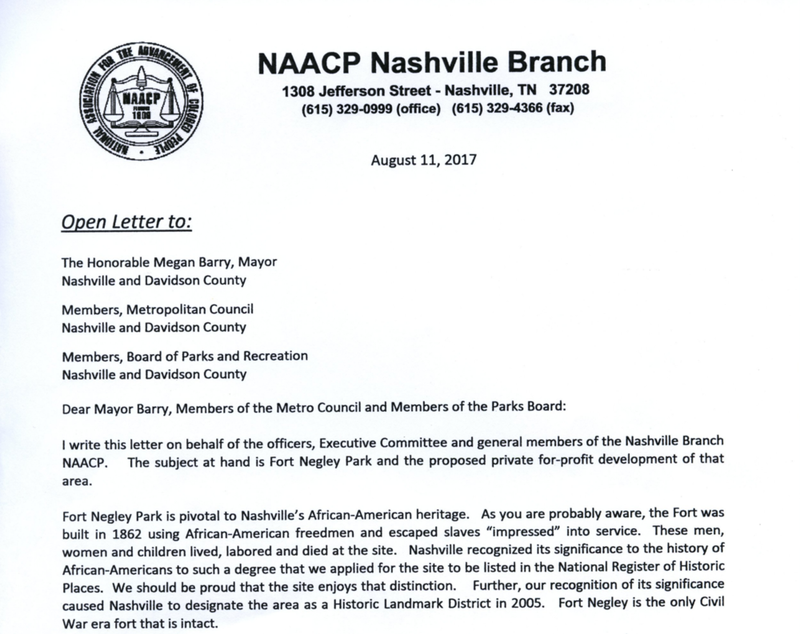 "Sadly, most of the hundreds of African Americans who helped build Fort Negley and protect the city of Nashville during the Civil War are lost to history, but the symbol that stands proudly today tells... an often forgotten piece of Nashville’s history." "For these reasons, I am not in favor of giving over any part of what should be a green crown jewel in Nashville's downtown for private development of any kind." "Given all that is at stake for the African American community only a deliberate and transparent process can hope to weigh the significance of this heritage site against the urge to develop it." "This city-owned park contains other important historic, cultural and natural landscape features that connect to virtually every era of Nashville’s past." "Right now, we have the once-in-a-lifetime opportunity to preserve existing park land–a most precious commodity in our rapidly growing city–and we urge Metro to consider our talking points above and protect this park and its green space." "Nashville has the opportunity to reclaim the Greer portion of Fort Negley Park as useable parkland that honors the historic intent and use for which it was purchased."